I have had so many issues with a couple of Australian patterns that I was beginning to become gun-shy in starting another project. Di Ford is a well-respected Designer and I had hoped to have no issues with Mountmellick. This time in making a complex quilt I am keeping the past lessons I have learned from past ‘mistakes’ from the Designer, and that I need to go slow, read and re-check the pattern each step of the way. So far so good and even though it is slow, I do believe that this will be a very successful project. This morning I am ready to put the first border on the center medallion. I always make the background fabric 2 inches larger than the pattern requires, mainly to ensure that I will be able to square the block, or medallion without issues! If the medallion is not perfectly squared the remainder of the quilt will be a total disaster! I started with a 20 1/2″ square did the math to ensure that when reducing the medallion to 18 1/2″ it would be perfect! I started by bringing my medallion down to a 19″ square. I have a 20 1/2″ Creative Grid ruler that really helps in accomplishing this step. Before I cut, I marked the background as to where I would cut and checking all sides to ensure equality on each side! Then I measured an additional 1/4″ on each side of the medallion inside the 19″ marking. BUT I did this by marking the medallion 1/8″ all around, checking to make sure it would be square, cutting it to 18 3/4″ and THEN measuring another 1/8″ to bring it to 18 1/2″ square. During this process I kept measuring from corner to corner to make sure all things were remaining square! After all of this I took the 18 1/2″ square and did a stay stitch on my newly cleaned Designer I to ensure that when sewing the first border there will not be an issue with flaring. (been there done that one before without a stay stitch). Here is a picture of the finished perfectly squared 18 1/2″ Center Medallion! So now to adding the first border. I want to thank Lu Ann Krug for sending me the border fabric for this quilt. It was a piece that she had left over from when she made the quilt. I met up with Lu Ann through her Blog in 2014 just as I was beginning to start on this quilt when my step son was diagnosed with terminal lung cancer. Here it is 3 years later and I am FINALLY back to a “sameness of routine” as my friend Gretchen stated in her morning post! This last year I discovered Gretchen and what a surprise to find out that Lu Ann and Gretchen are friends and live in what I call “Quilter’s Heaven” because of their love of quilting! How I would love to live closer and attend the Retreats with them! Both ladies are great and dedicated quilters. Well, off to put the first border on….. more to follow! 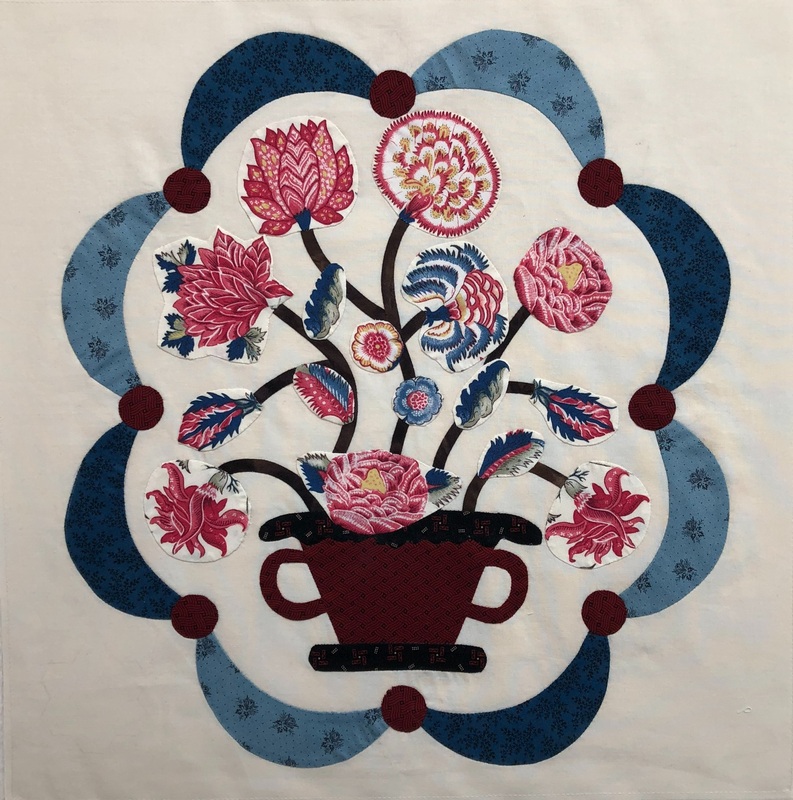 This entry was posted in Quilting and tagged Di Ford Mountmellick, Gretchen, Gretchen's Little Corner, Husqvarna Designer I, One Loose Thread. Bookmark the permalink. ← Rockport Texas, Mountmellick, Prensencia Thread and My D1! Your center looks perfect. I hope the circle border goes well. I certainly do live within driving distance of a bounty of quilt shops. Happy stitching! I worked on this one so that there would not be hair pulling in LV! Beautiful! So glad you didn’t have issues, I hope to start my soon. Love read your blog. I met Gretchen through our blogs only to find out her husband and my husband have known each other for years. I make the 7 hour drive out there to attend the retreats. It is good to read your detailed approach to squaring up that center block. The first thing I did with Di -Ford-Hall’s Bally Bird center was to cut it 1/2 inch too small. Good thing I have an extra yard of the fabric to start over. Bally Bird – hum wonder if that one is in her books – need to check it out. Yup I really enjoy Gretchen! I would love to live up there – so many wonderful quilters and quilt shops. South Texas is another world into its self! Your medallion center looks very good. All looks very straight and square. You had quite a routine to do it but it worked well for you.